This webinar has already occurred. See below for a screencast of the event and add to the discussion. 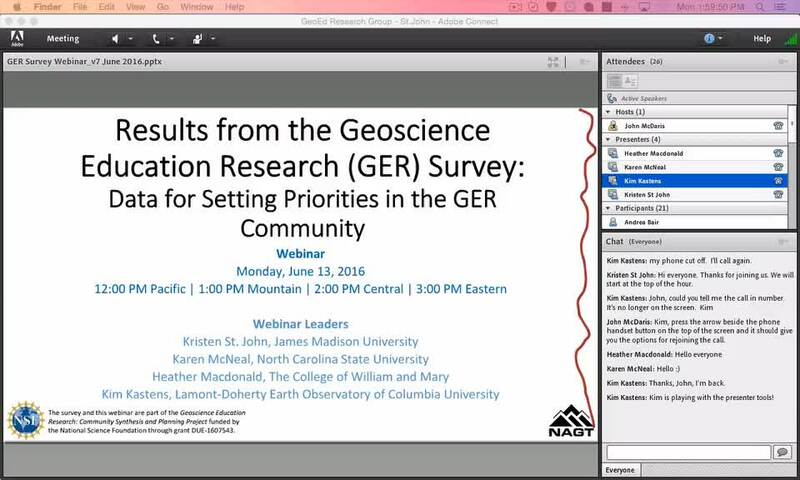 Description: Please join us for a webinar on Monday, June 13 at 3:00 pm (Eastern) to learn and discuss the results from the Spring 2016 geoscience education research (GER) community needs survey. There were 185 responses from geoscience education researchers and scholars. This is a rich dataset that can be used to help set priorities for the GER community on career navigation, professional development, publication needs, access to GER data to support meta-analyses and other studies, and access and development of geoscience education research instruments and tools. The survey and the webinar are supported by the NSF. This webinar is open to anyone who is interested in Geoscience Education Research or Discipline-Based Education Research, more broadly. Click here to view the webinar screencast. Thanks to my colleagues Kim Kasten, Karen McNeal, and Heather Macdonald for helping co-lead this webinar and to the participants - it was an engaging Q&A period at the end. Thanks too to John McDaris for helping facilitate the technology side of it and getting the recording out so quickly. One follow-up comment now to the chat discussion: Diversity issues as a area for more GER was raised in the discussion, although it did not rise as a highest GER community need in the survey results. Nevertheless this is an important topic. [Note: the survey focused on needs to better support GER workers, not on what geo ed topics GER workers should focus their research on]. To move forward more effectively and efficiently on ways GER can address diversity-issues in the geosciences I think it will help to build on synthesis-level evidence about what we know and what gaps exist in this field. Therefore I wanted to share that the JGE GER theme issue editors received letters of intent from multiple potential authors who plan to write literature reviews on diversity issues in the geosciences. Its great to see the community already moving in this direction. I really happy found this website eventually and that is the reason i like to share this with all of you my friends, This https://windowsclassroom.com/how-to-split-screen-on-windows-10 will share idea which you need to know how to split screen of windows 10 Operating system. This is the most interesting feature of Microsoft.